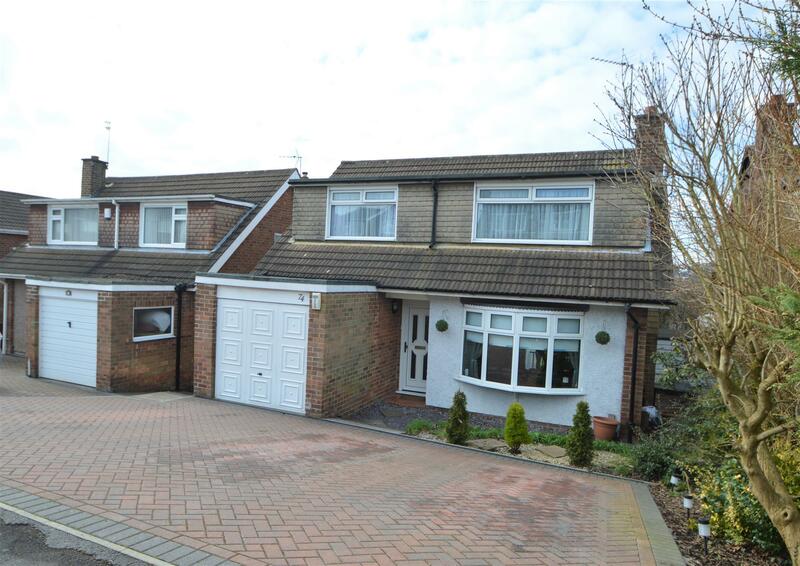 Benjamins are delighted to bring to the market this detached family home, with four bedrooms situated on Mount Pleasant in the sought after village of Keyworth. The accommodation briefly comprises: Entrance hall, living room and dining area, kitchen, downstairs cloak room, integral garage, four bedrooms, family bathroom. Block paved drive to the front and enclosed garden to the rear. We recommend an internal viewing. Entrance is through a white UPVC door with glazed panes, there are stairs up to the first floor and access to the lounge and cloakroom. Having a low flush WC, wall hung hand wash basin, heated towel rail and a window to the side aspect. A split level open plan lounge and dining area. The lounge area is to the front of the house and has a bow window, fireplace with tiled hearth and wooden mantelpiece, ceiling light point and wall lights. There is a banister separating the dining area with a step down to the laminate floor, radiator and sliding patio doors. Having a white fitted kitchen with a range of cupboards and draws, laminate worktop, gas hob, Belfast sink and mixer tap, tiled walls, window to the rear, gas boiler, plumbing for a washing machine and a dishwasher, space for a fridge freezer with external door to the side of the house. With a loft hatch, airing cupboard with hot water tank and access to the upstairs rooms. With UPVC double glazed window to the front aspect, ceiling light fitting, radiator, laminate flooring, recessed wardrobes. With UPVC double glazed window to the rear aspect, ceiling light fitting, radiator. With UPVC double glazed window to the front aspect, ceiling light fitting, radiator. Having a white three-piece suite which comprises of a bath with panel side, pedestal wash basin and a low flush wc. There is also an electric shower over the bath, window to the rear, radiator and ceiling light point. At the front of the property is a block paved driveway with space for three cars which gives access to the integral single garage. There is a side gate which leads to a pleasant rear garden which is mainly laid to lawn, large summer house, a decked area across the rear of the house and a further decked area at the end of the garden.